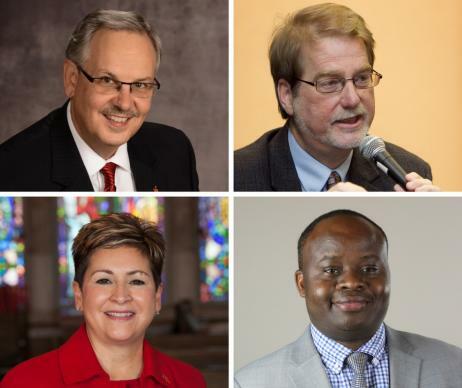 The Bishops of The United Methodist Church will meet in Chicago from April 29-May 4 to celebrate leadership through the passing of the gavel, certify constitutional amendments and finalize their recommendations to the 2019 Special Session of the General Conference. At the Chicago meeting, the bishops will also certify the votes of annual conferences on the five constitutional amendments approved by the 2016 General Conference. During the 2016 General Conference, delegates approved five proposed amendments to the Constitution of The United Methodist Church as contained in The Book of Discipline (BOD). Any proposed constitutional amendments require ratification by annual conferences. The results are canvassed, certified and announced by the Council of Bishops. The first proposed amendment proposes a new paragraph between current ¶ 5 and ¶ 6. This new paragraph focuses on gender justice. If ratified, this would become the new ¶6, and the current ¶¶ 6-61 would be renumbered as ¶¶ 7-62. The bishops are also working on making their final recommendations for the 2019 Special Session of General Conference which has been set for Feb. 23-26 in St. Louis, Missouri. During their meeting next week, the bishops will hear the final recommendations from the Commission on a Way Forward.